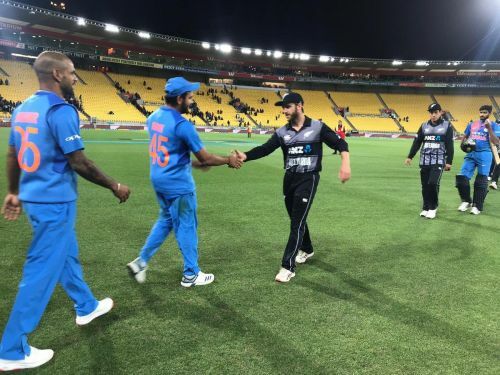 The Blackcaps are set to host the Indian team for the 2nd T20I at the Eden Park, Auckland after hammering the visitors by 80 runs in an entirely one-sided affair. Team India, on the other hand, must be eyeing to land a counter-punch in this crunch match after being handed their biggest defeat in terms of runs. Both the sides will lock horns on Friday evening in what is anticipated to be a cracker of a contest between the two heavyweights. Having won the toss, team India decided to field first which eventually backfired because the pitch was a nightmare for bowlers. Colin Munro (34) and Tim Siefert (84) gave the hosts a flying start in the powerplay. The young wicket-keeper was declared the ‘Man of the Match’ for his outstanding inning of 84 runs off just 43 balls. Kane Williamson (34 off 22) and Scott Kuggeleijn (20 off 7) also made some crucial contributions to help their side put a mammoth score of 219-6. India started the chase terribly as the skipper got out to Tim Southee in the third over getting caught in the deep trying to hit one out of the park. Dhawan and Vijay Shankar steadied the ship for a while before the former was cleaned up by a toe-crushing Yorker from Lockie Ferguson. At the end of the batting powerplay, the visitors lost both the openers with just 52 runs on the board. Wickets kept regularly falling from both the ends and soon team India were bundled out for only 139 runs. Such massive defeat will serve as a reality check for the Indian camp, who would be eyeing to bounce back in the must-win match. Indian management might consider making some changes heading into this crunch game. Shubman Gill, Siddharth Kaul, and Kuldeep Yadav might be seen in the playing eleven. However, the home side might go with the same eleven as they will not look to disturb their winning combination. Date: Friday, February 08, 2019. Kuldeep Yadav can get a chance in this match. Doug Bracewell might come in to replace Scott Kuggeleijn. Either James Neesham or Colin de Grandhomme will be in playing 11.